It’s time to take the big leap and become a homeowner … in Tamriel. 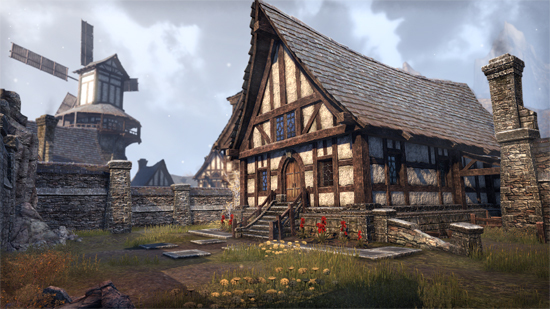 Xbox One and PlayStation 4 players of The Elder Scrolls Online receive the first major DLC of 2017 – Homestead – a free update that will allow them to buy apartments, homes, manors – and even an island – in Tamriel. Available for both in-game Gold and through the Crown Store, homes can be customized with more than 2,000 decorating items, including furniture, décor, books, barrels and a whole lot more. Tons of Homes – First One Free! Homestead releases with nearly 40 instanced homes to choose from, each styled after one of the game’s 10 playable races. Anyone who would like to grab their own Tamriel digs can get one for free through an initial tutorial quest. Once that introductory quest is completed, players can move on and up, owning multiple homes of various sizes that can be shared across all of their in-game characters. Owning a house is only the beginning of Homestead – it’s not truly a home until you decorate it. Players can make their new residences truly unique by acquiring and placing more than 2,000 items with the game’s new Housing Editor. Furniture and other décor are available through in-game vendors and the Crown Store, but players can also craft their own using existing crafting skills. Available décor includes tables, chairs, chests, beds, bars, counters as well as decorating items like books, food, barrels, paintings, light fixtures, plants, trees, and more. Looking for more utility? Players can also place items like combat dummies, crafting tables and assistants in their homes.